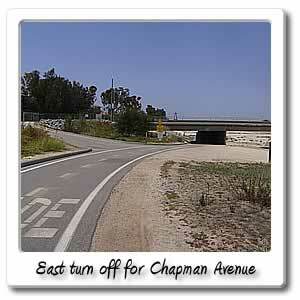 Welcome to Chapman Avenue on the Santa Ana River bicycle trail. 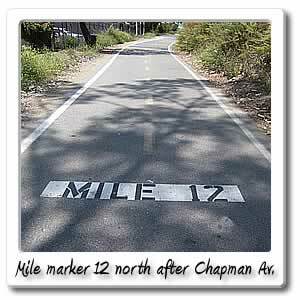 Just 12 miles from the beach, we have the Chapman Avenue entry/exit point. Heading off the first exit, will take you east. There are lots of businesses and food places all along Chapman Avenue, first thing you will see is a Burger King. close by is Chinese food, and a liquor store, and Wienershnitzel. If you keep going, there will be a McDonald's, Del Taco, Domino's and Lampost Pizza. Then there's an El Pollo Loco, then a mile after getting off the trail, will be Main Street, where you will find a grocery store, Starbucks, and Quiznos. If you go 1/2 south on Main, that will take you to St. Joseph Hospital. 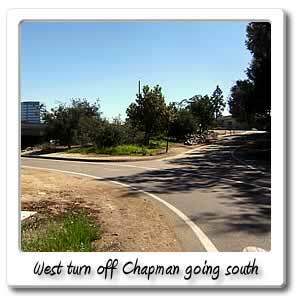 If you continue east on Chapman, for another mile, that will take you to Glassell Street where the Orange Circle is located. Orange Cycle, is located at that intersection, for all your bicycling needs. Around the same intersection, are all kinds of antique shops and other old time style stores around a round about street with a fountain in the middle of it. Also in the same area you can hop aboard the Metrolink train, with your bike and travel to just about any area in Southern California. 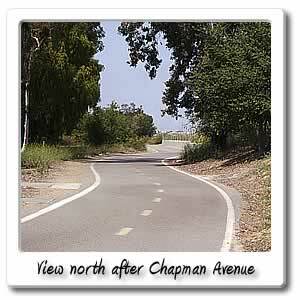 One of the stops takes you to the Tustin Avenue entry and exit point, that's located 5 miles from the Chapman Avenue entry going north on the trail. 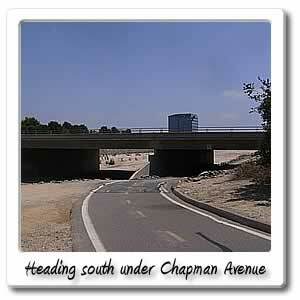 If you think there was alot of places going east, wait until, you see what is in store going west on Chapman Avenue. Off to the side you will see a Denny's not far off the trail, there's a Jack in the Box there too. Half a mile off of the trail, is The City Drive. Right at the corner is UCI hospital, and again is the Shops of Orange, if you didn't get off at the Garden Grove Blvd./ Memory Lane entry and exit point. See that page to see some of the things that the mall has to offer. 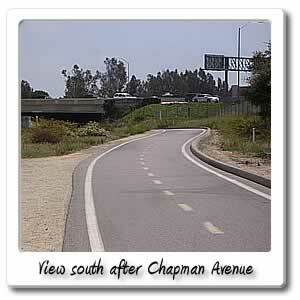 Continuing on Chapman Avenue for another 1/2 miles past the City Drive is Lewis Street, where you'll find a Taco Bell, and liquor store, and then across the street Crystal Cathedral. Going another half mile, will be a donut shop, and a Vons and other stores, across from that is Twin Lake Park, and yes it has a drinking fountain, benches, restrooms' and a nice lake in the middle of it.